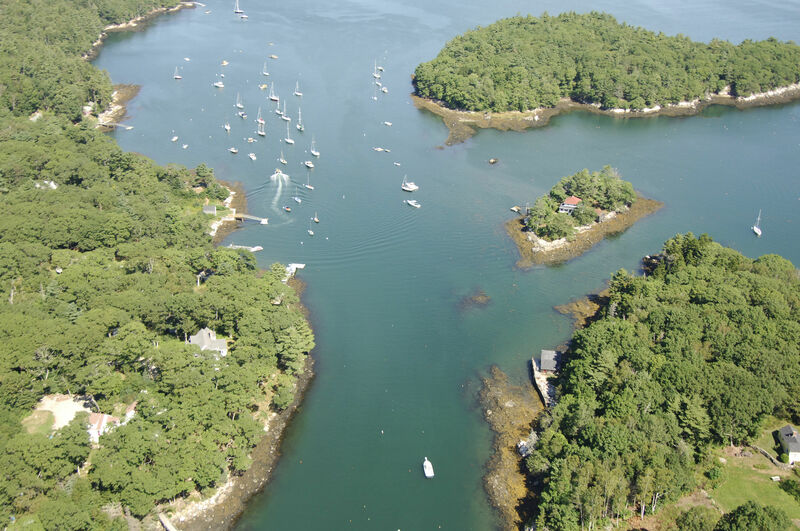 The Gut is a narrow passage of water that not only allows passage between Johns Bay and the Damariscotta River, but it also divides and creates Rutherford Island away from the mainland. 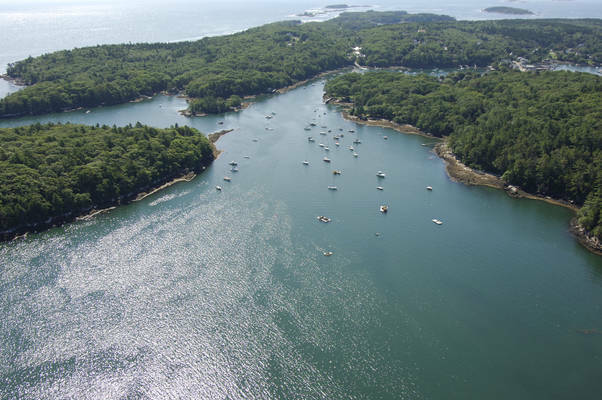 The Gut is located off the town of South Bristol and situated three miles northwest of Pemaquid Point and four miles northeast of Boothbay Harbor. The image above is a view from the northeast looking southwest over the east entrance of The Gut at Witch Island. Off in the left (south) portion of the image is Rutherford Island, while in the lower right-hand corner (north), Witch Island is visible. 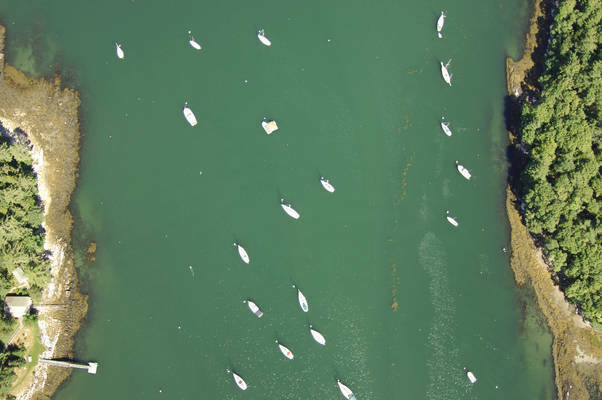 Also take not of the many lobster trap floats that are visible along the channel. 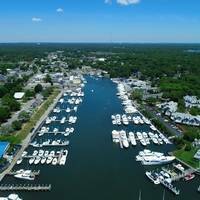 Despite its relatively small geographical size and narrow channel, The Gut is home to four well-equipped marine service and marina facilities. Two of the facilities are located on the west side of the aforementioned swing bridge and two are located to its east. 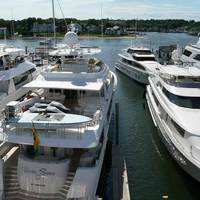 If you are looking for transient slips, Gamage Shipyard Storage and Repair and Osiers Wharf both have slips available for visiting boaters. Both of these facilities also pump gas and diesel fuel. 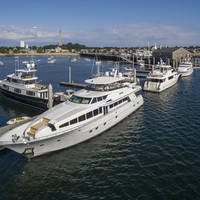 The moorings in the Gut are maintained by the Bittersweet Landing Boatyard and Gamage Shipyard Storage and Repair. Bittersweet Landing Boatyard and Gamage Shipyard Storage and Repair both have lifts for haul-outs and related repair services. The east side of The Gut is approached via an easterly approach from Johns Bay south of Corvette Ledge. First set a course to intercept green can 1, which marks the location of Corvette Ledge, a three-foot-deep, dangerous rock ledge. Green can buoy 1 is located at an approximate waypoint of N43 52.310 W69 32.766. Make sure you give green can buoy 1 considerable room; Corvette Ledge is quite dangerous. Once you have cleared green can buoy 1, head north, and then around the north wide of Witch Island to the west, making sure to stay well north of the northern tip of the island, where a rock shoal lies. After you are well west of Witch Island, head south and follow the unmarked, but fairly easy to see channel toward the swing bridge (three-foot vertical clearance). No reviews yet! Be the first to write a review of The Gut Inlet East.